Sangam DMC (Digital Media City): The Future is Here! Something quite surprising is unfolding in Digital Media City, located in the Sangam district of Mapo-gu. Quickly moving into the area are facilities related to information technology (IT) and culture, including media entertainment, the foundation of Digital Media City itself. A visit to the DMC Gallery---a virtual prologue to the city of the future---gives us a solid sense of the exciting digital world that is almost upon us. There are plenty of hands-on digital experiences to be had at the nearby Digital Pavilion, too. 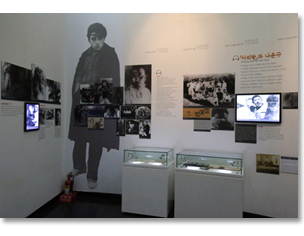 The Korean Film Museum, meanwhile, is a cinematic journey looking back at a century of Korean cinema. 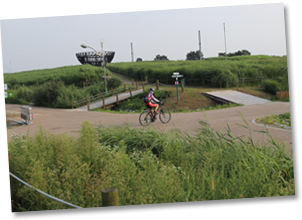 In the nearby Nanjido district there's World Cup Park, a tribute to the regenerative power of nature. Once a lovely island covered in flowers, Nanjido was transformed into a big, smelly garbage dump before being transformed once again into beautiful park space. 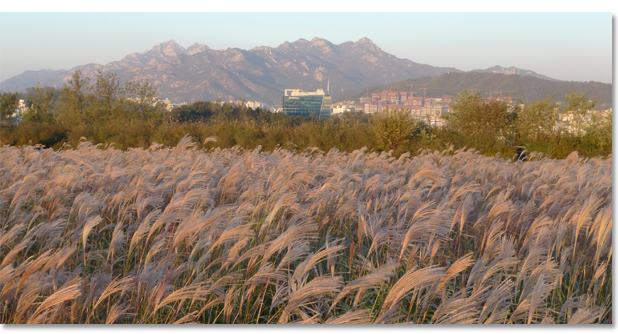 One section of the park, Haneul Park, is famous for its fields of beautiful reeds. Another section, Noeul Park, has become one of Seoul's best-loved sunset spots. To sum up, Nanjido could be the subject of a very moving documentary. 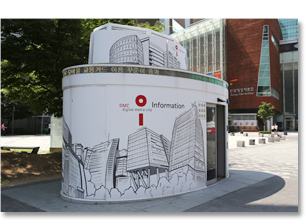 The DMC Tourism Information Booth is an unmanned information booth in front of the Digital Pavilion. Open the door, press the touch screen and detailed travel information about Sangam DMC appears. You can make use of the public bicycles in front of DMC Gallery to conveniently get around the Digital Media City area. As you make your way from DMC Gallery to the sculpture "Millennium Child" in Guryong Park, you'll pass five so-called "art fences," each one painted according to a different theme. 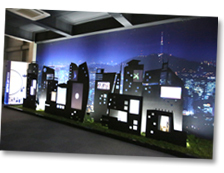 Samgam Digital Media City represents Korea's biggest collection of digital media companies and facilities. DMC Gallery is an exhibit hall where you can get a preview of the wondrous city of the future, where all things can be done with just the press of finger. As soon as you enter DMC Gallery, you can see a model of the entire Sangam DMC complex. The marvels presented by the companies that have moved into the DMC and the 3D film shown in the gallery give visitors a real sense of the futuristic complex. "THEY," a public art project installed in front of the gallery, symbolizes the city of the future. In the image of a woman looking at the sky embracing a man looking at the ground, we can see a world where mankind and media come together. The work of art is even more inspiring at night, when it's illuminated by LED lights. It gets you thinking of how day and night harmonize and how great things await DMC's future. Business Hours : 10am to 6pm, closed on Sundays and public holidays. A new world unfolds at the Digital Pavilion, where you operate a computer with a single finger sans a mouse and where you can immediately change the pictures on the wall with the swipe of the hand. This is where we can get a real sense of our ubiquitous future, where digital technology permeates all aspects of our lives. With a RFID card obtained from the first floor you can experience the entire virtual world. In the 2nd floor Exploration Center you can play a musical instrument using just a single card or drive a virtual automobile. The "Live Sketch Book" corner is especially popular with both adults and children. After choosing on the monitor which animal you'd like, you color it in and it appears on screen as a "digital pet." You can then take a stroll with this digital pet along a "digital road." Watching the pet follow you along, you'll be amazed by how life-like it is. This is what digital media is able to accomplish today. 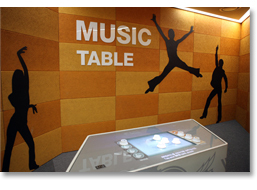 The 3rd floor IT Imagination Center shows us how our lives will be enriched by ubiquitous information technology. Create a digital life form---say, a fish---and let it swim in a digital pond. Or cross of the "ecobridge," a futuristic crosswalk that is able to detect footsteps and stop cars even without a traffic light---it's hoped this technology will reduce traffic accidents. It's thrilling to contemplate that the time is not far off when we'll be able to make it snow with just a thought alone, watch films without a TV and receive medical treatment without going to the hospital. From Exit 2 of Digital Media City Station (Line 6 or airport line), take bus No. 771, 7711 or 7730 and get off at Nuri Dream Square. Business Hours : 10am to 6pm (admission ends at 4:30pm). Closed Mondays and the long Chuseok and Lunar New Year holidays. In June 1903, the Hanseong Electric Company began showing French films in its tram warehouse in Dongdaemun. The first Korean film---produced with Korean capital by a Korean staff---is said to be the 1924 film "The Story of Janghwa and Hongnyeon." This was about 100 years ago. 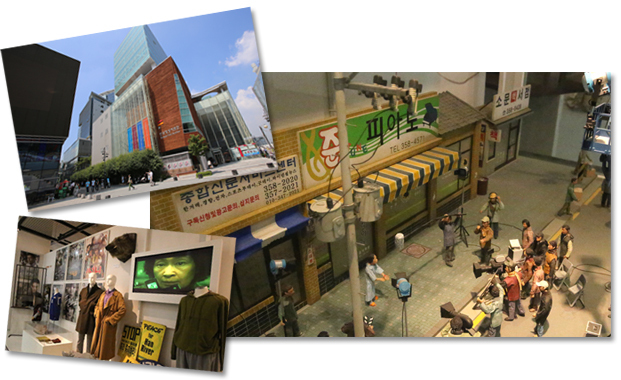 The Korean Film Museum can be called a trip back in time to explore Korea's cinematic history. From Korea's silent films to the Korean film industries' recent successes both at the local box office and international film festivals, we are treated to a panorama of the accomplishments of Korean cinema. Here we can learn the stories of producer Na Woon-gyu's 1926 film "Arirang," which depicts the pain suffered by Koreans under Japanese imperial rule, and director Im Kwon-taek's 1993 film "Sopyonje," which sparked a renaissance of Korean film. 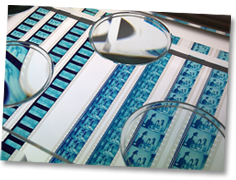 We can also learn the background to the development of Korean genre films over the ages. You'll want to check out the "Representation of Women in Korean Films" section, too. In one corner of the museum is a reconstruction of the Wongaksa, Korea's first theater. This is where they used to show silent films in the old days. Back then, a reader would sit in a corner and read out the lines of the film as it unfolded on the screen. It's an unfamiliar sight to people today, but it's still got a lot of yesteryear charm. On the museum's 2nd floor you'll find the Animation Room and Principles Behind Images Exhibition. The museum provides free audio guides (English, Japanese, Chinese), and exhibit tours are given at 3pm on weekdays and 11am and 3pm on weekends. If you're in a group of 10 or more, you can get a guided tour any time you want (provided you make a reservation ahead of time). From Exit 2 of Digital Media City Station (Line 6 or airport line), take bus No. 771, 7711 or 7730 and get off at Nuri Dream Square. Just head straight towards the Digital Pavilion and head into the building next to it. Business Hours : 10am to 7pm (Tues~Fri), 10am to 6pm (Sat~Sun, Holidays). Closed Mondays, Jan 1, and the long Chuseok and Lunar New Year holidays. Located in the Hangang River, Nanjido was once a beautiful island covered in lovely blossoms. In 1978, however, the city began to use the island as a landfill. Once a low-laying island, it soon became a mountain of trash. Fortunately, a project to return Nanjido to its original beauty began in 1996. 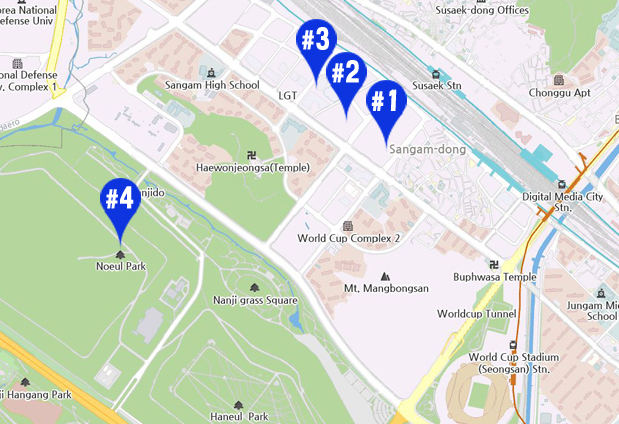 From 2002, a series of parks---Peace Park, Nanjicheon Park, Haneul Park and Noeul Park---were opened in the area around World Cup Stadium. Nanjido had found a new vitality. The horrific stench of garbage having been banished, flowers returned to the recovered land where roe deer now roamed free. People, too, returned to the island to rest and recharge. World Cup Park, as the system of parks is now called, is a place where we can watch the miracles of nature as they unfold. Haneul Park ("Sky Park") gets its name because it is at the highest elevation of World Cup Park's sub-parks. To get to Haneul Park, you should climb the so-called "Haneul Steps" at the east end of the park. You can also reach it via the road the separates it from Noeul Park next door. Slowly walking the Haneul Steps is the best way to enjoy the park's history and scenery, but if you prefer, there's an electric car that departs from the entrance of Nanjicheon Park's parking lot which will take you to the summit of the park. Haneul Park's soil is still quite poor and the painful history of Nanjido hasn't completely disappeared, but in the mesmerizing reeds that wave amidst the park's vast fields we can feel the regenerative power of nature. The hilltop wind turns the park's wind turbines that produce the clean energy on which the park operates; the turbines also lend a scenic beauty to the trails that crisscross the fields. There's an acupressure walking path, too, for the health-conscious. In the center of the park is an installation/observatory called "Bowl Containing the Sky." It offers refreshing views over Seoul, including Bukhansan National Park, Mt. Namsan, the 63 Building, Hangang River and Haengju Fortress. Ever October, the park's reeds turn a most mesmerizing golden. To celebrate this, Seoul hosts an annual Reed Festival, a favorite with travelers and photographers. Outside the park is a path lined with metasequoia trees; this, too, is a good place to walk and think. 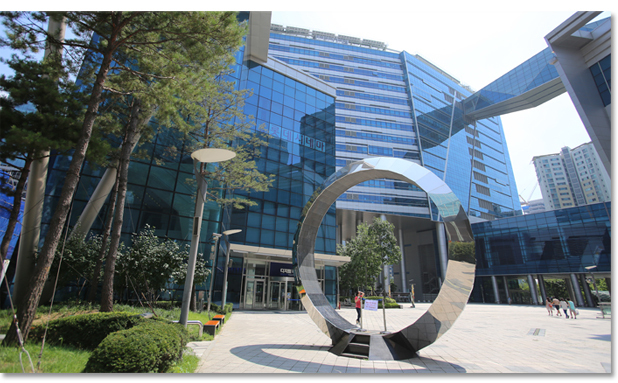 In between Haneul Park and Noeul Park is the SeMA Nanji Residency. Prior to its remodeling for use as an artists' studio, this place was a landfill leachate treatment facility. Today it is a delivery room where the next generation of Korea's artists are born. 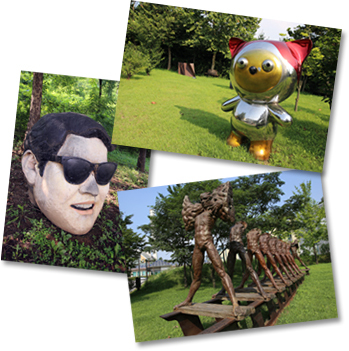 In its outdoor garden are displayed works from the Seoul Museum of Art, including "The Fall of Icarus," "L-Ssi" and "Express Train: Changes of the Times." In front of the spot where you board the electric car is an ecological hall dedicated to the firefly, a rare sight indeed in today's Korea. 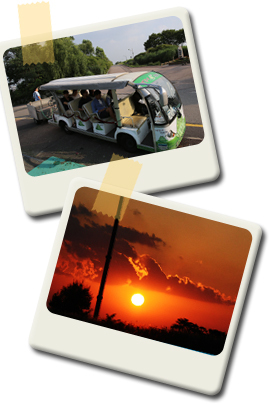 The electric car in the parking lot of Noeul Park will take you to the top of the park. As you ascend, the scenery of Seoul unfolds in all four directions. If you'd like to enjoy this scenery a bit more fully, you could always walk instead of taking the car. Noeul Park ("Sunset Park") gets its name because, as the westernmost part of World Cup Park, it offers some of the finest sunsets in Seoul. 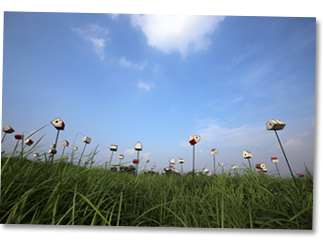 It also serves as a culture and arts space, too---its wide grass fields are home to works of sculpture. For the best views of the Hangang River, make your way to the observatory deck. From the observatory deck there's a wooden staircase that will take you to Nanji Hangang Park. If you arrive at the observatory early, you can wait with a cup of coffee at Noeul Cafe. The cafe is also a great place to bring a date. Noeul Park is something of an ecological treasure trove, where wild animals like roe deer and raccoons run free. When World Cup Park was first created, this section was used as a public golf course, but in 2008 it was transformed into a family park with a camp ground. After taking in the sunset, the animals head to their burrows and the people to their tents to spend the night. This is where you come to feel man and nature coming together as one. 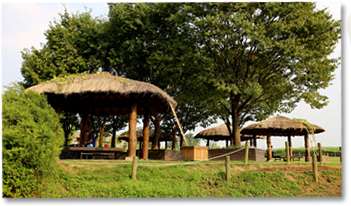 To use Noeul Campground, you must make a reservation (first come, first serve) through the Internet. You can use the site from 2pm to noon the next day; campers must arrive by 10pm. The site is closed Mondays. The fee for an overnight stay is KRW 13,000 (KRW 10,000 if you don't use electricity). Since driving within the park is prohibited, you must park in the parking lot and take the electric car to the campground or walk. If you've got a lot of gear, however, you can drive up to the site, unload the gear, and drive back down to park your car. There's a parking lot in Nanji Hangang Park, too. You can rent a tent, barbecue grill and other camping equipment onsite and purchase vegetables, meat and beverages from the onsite shop. 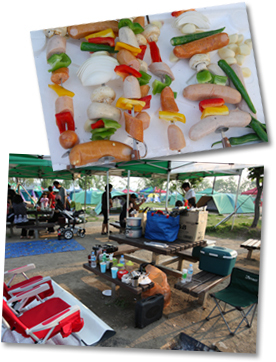 A barbecue party on the shore of the Hangang River is a most novel experience.